Within Provektor’s end-to-end offering for security systems, we offer access control systems, solutions for CCTV surveillance, and various types of alarm. The purpose of the services is to increase and simplify security for organisations, create a safe environment for people and protect tangible assets. We can provide services separately or as part of a larger tailor-made complete solution. Installing a card-reader keeps unauthorised persons out and avoids the need to manage keys. To improve security even more, you can use codes or tags. You can also implement browser-based booking systems for e.g. conference rooms. 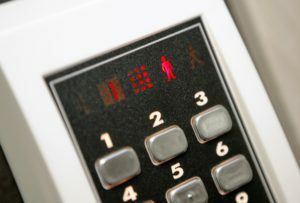 Access control systems can be combined with entry phones for efficient handling of visitors. It is more and more common for companies to monitor purely industrial processes remotely, and here CCTV is very practical and efficient. Needless to say, we also work with traditional surveillance of sites and buildings linked to alarm functions. When it comes to image handling and different ways of storing media, there are now solutions to everything from local handling to networked solutions. As well as looking after planning and installation, we also help with applications and licensing formalities where required. We plan and design security systems to customers’ needs and requirements. There is now great scope for producing a tailor-made security system with attack alarms, access control, evacuation alarms and CCTV. This alarm is possibly the most important safeguard as it can save both human lives and major tangible assets. We now work with several approved systems firms and can help you with planning and installation of your chosen alarm solution. Want to know more about Access control and alarms?